I like to define a marketing campaign as a promotion created to reach a specific goal with a beginning and an end date. A marketing campaign can be used to introduce new products, retain existing users, or increase market share. A well-managed campaign can maximize the effect of ads, discounts, and direct mail. In other words, marketing campaigns are used to promote a product through different channels – including, television, radio, print media and online platforms. Campaigns do not have to rely solely on advertising – it can comprise of tradeshows, webinars, word of mouth and other interactive techniques. Businesses, operating in highly competitive markets, may initiate frequent marketing campaigns and devote significant resources to generate brand awareness and sales. Marketing campaigns can be designed with different goals in mind – including, building a brand image, introducing a new product, increasing sales of a product already on the market, or even reducing the impact of negative news. Similar to other marketing platforms, Pardot allows us to create a campaign and associate prospects with it so that we can calculate ROI at the end. In Pardot, campaigns are typically thematic touch-points and are used to track a prospect’s first touch point. Thematic touch-point captures the first marketing element – or touch point – through which a prospect gets exposed to your campaign. Since, by default, prospects are associated with a campaign of the first marketing element they encounter, in order to create a prospect, you must first select a campaign. However, if you do not want to associate prospects with a campaign then, you should reach out to Pardot Support to change your account settings. It is possible to update campaign Association for a prospect using automation rule, page action, upon import, or via manual update etc. Currently, in Pardot, a prospect can be associated with only one campaign at a time. As a result, prospect and campaign have 1:1 relationship. This, as oppose to in Salesforce, where a Lead and campaign have M:M relationship via the campaign member object. Email Plug-in – Prospect will associate with email plug-in campaign, only when if their first touch point is a tracked email sent to them. Website Tracking – Prospects will associate with website tracking campaign, only when if their first touch point is your company website or any page with your account’s tracking code added. If, on the other hand, you have verified Google AdWords Connector then, a third default campaign will be created to track all ROI from your AdWords campaigns. You can use Pardot campaigns for reporting. Let us start with a business use case. David Haditsch is working as Campaign Manager at GurukulOnCloud. At GurukulOnCloud, they have decided to run a campaign to promote their products and track activities of visitors and prospects on the corporate website. Set a Cost (cost for running this campaign) for the campaign with which you can track ROI, for this scenario enter 10000. At the end, select Archive Date to filter reports and show Current or Archived campaigns. 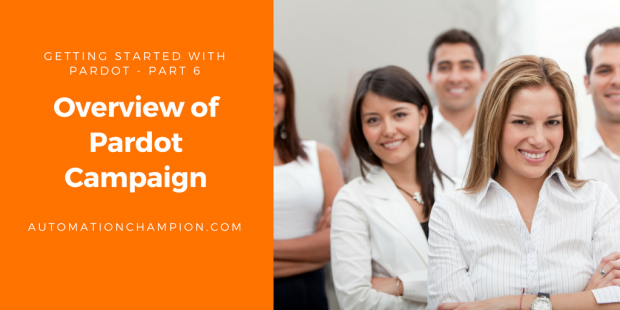 Navigate to Marketing | Campaigns. Open the campaign, whose tracking you would like to include on your website – in this scenario Brand Awareness campaign. Manual Action – You can manually update the prospect’s campaign when editing the prospect record. Automation Rule – Use automation rule to change campaign for a prospect based on certain criteria (for example, filed a Form Handler or downloaded a file). Import Action – When importing prospects you can choose a campaign to override campaign of all prospects who exist in a .csv file. Completion Action – You can use Completion Actions to change the prospect campaign association. Completion action is available for form, form handlers, files, custom redirects, emails and page actions. –> If a prospect’s first touch is a landing page with a form and, if the landing page and the form are tagged with different campaigns then, the prospect will be tagged with the landing page’s campaign. –> Your Campaigns are pulled into Pardot during the pull/sync routine. If you create a new campaign object in Salesforce, you may have to wait a few minutes until it is available in Pardot. –> If a campaign is deleted, the campaign will be sent to the recycle bin and prospects associated with it will still be tagged with that campaign. In my next blog, I will take a deeper dive by showing you how to create Form in Pardot and use it to generate prospects.